GRAFENWOEHR, Germany — The Army program designed to aid leaders and sponsors during relocation of their personnel will be held at U.S. Army Garrison Bavaria March 15. USAG Bavaria’s Directorate of Human Resources conducts the Total Army Sponsorship Program Rodeo, or TASP Rodeo, March 15, 2018, beginning at 9 a.m. at the Rose Barracks Multi-Purpose Complex, Bldg. 143, in Vilseck. 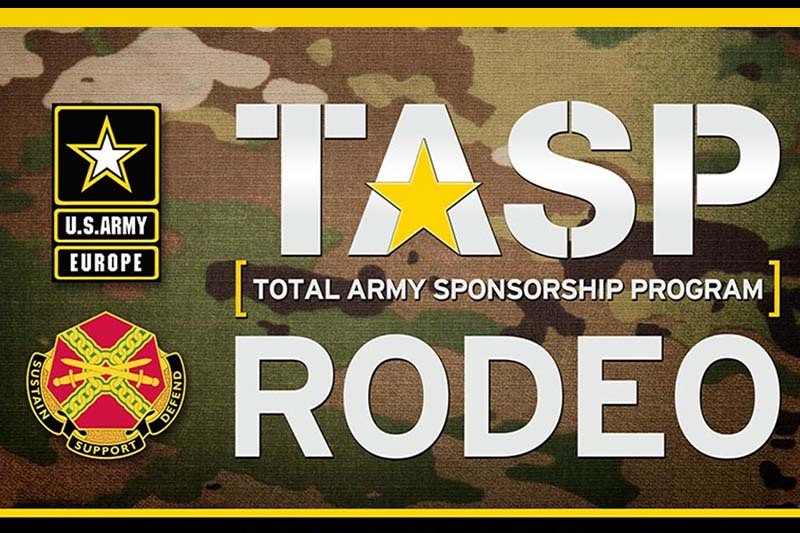 Sponsors and leaders should attend the TASP Rodeo to improve the overall sponsorship experience of future Soldiers and civilians. Participants can register on-site. The intent of the TASP rodeo is to increase readiness by aiding leaders and sponsors to support newly assigned personnel moving from one installation to another, said event organizer and military personnel specialist Earl Mallard. The rodeo gives sponsors and leaders the information and referral services they need to effectively sponsor new personnel coming to USAG Bavaria. Organizations directly involved in the sponsorship process will provide rodeo-goers the opportunity to visit various agencies and receive training on how those agencies support the sponsorship program. In the past, Soldiers had expressed frustration at the ineffectiveness of TASP. But direct garrison involvement aims to improve shortcomings and enhance the overall process. “This process provides the structure and foundations for units to welcome and help prepare Soldiers, civilian employees and family members for their new duty station prior to their actual arrival,” said Mallard, who also serves as the USAG Bavaria sponsorship liaison. The rodeo will also cover the use of the Army Career Tracker Sponsorship Module to request and track sponsorship for all E1s to O6s. The Total Army Sponsorship Program Rodeo is open to active Army, Army National Guard, Army Reserves and civilian employees assigned to positions within the Department of the Army.